In stock 191 items in stock. There's nothing worse than getting ready for a good hack and then realizing that you can't even get the box open because you don't have the right screwdriver. Sure, we all have a few Phillips-head drivers and maybe a few slotted drivers but what about Torx, Hex Socket or Tri-Wing? This kit has them all. 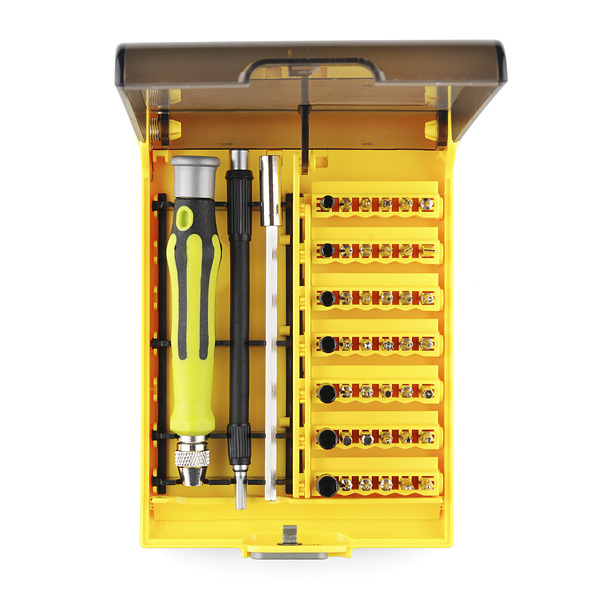 Along with a large variety of interchangeable bits and a hard ABS plastic handle, the kit also includes a steel extension bar and a flexible extension neck that really comes in handy when you're hacking in tight spaces. 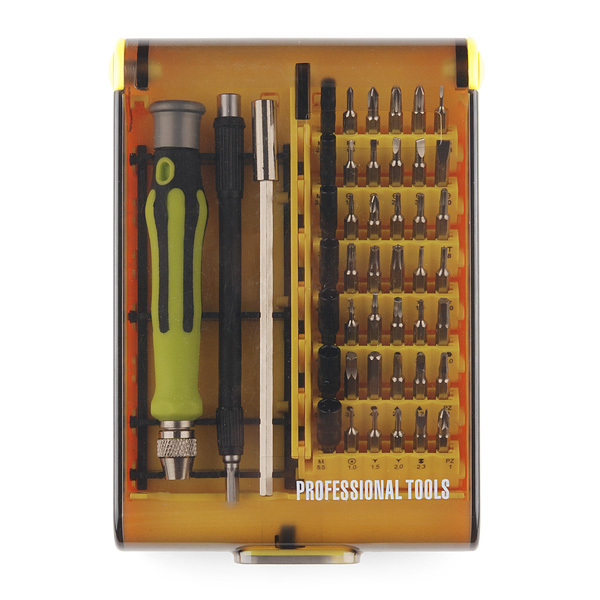 The plastic case keeps everything secure and organized with labeled sockets for each bit. 6.5 x 4.5 x 1.25"
Now I can screw everything! !, amazing tools. Ten dollars What a deal! There is a really great set of bits included, you dont get the 12 different philips bits instead you get a much wider (and useful imo) variety of bits. As others noted you have to use the extension for just about everything or the bits will slip. I wish the extension could fit in the nice flip up case they give you. Having said all that, for $10 you cant go wrong imo. You guys should ship this with a heavy-duty rubber band to hold it closed for when the latch inevitably fails. Great little kit for the price, but annoying that it's spring loaded and won't stay shut in my drawer. Use the long metal bit extension. Insert it all the way into the chuck and tighten. Now you have a magnetic socket in which to place the bits and they will not loosen or fall into the handle. do these have the security torx? (drilled in the center) if yes, what sizes? 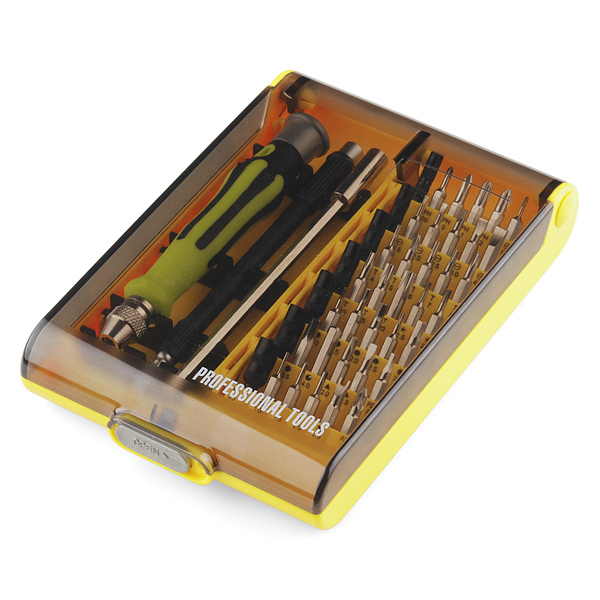 This screw set does come with 4 security torx bits, T8, T10, T15 and T20. The actually hole sizes vary as well. The T8's hole is 0.85 mm in diameter, T10 is 1 mm, T15 is 1.40 mm, and T20 is 1.60 mm. The holes are probably .5 mm to 1 mm deep. Different screw sets may vary. I bought this from china and it took several months to arrive. Had I just waited, I could have gotten it from spark fun for the same price. Con: Maybe its just me, but since the handle is hollow, the bits like to collapse inside whenever I put any force on it at all. I modified mine by filling the hollow handle with a wooden chopstick. Now it works great. Absolute best kit for $10 anywhere! Now for ten dollars you can't really go wrong... But A few things I think should be noted. The actual screwdriver (not the bits) is hollow and does not really have a solid way of blocking bits from going inside. So unless you tighten the hell out of the screw-to-tighten bit holding device... The bits shoot up into the handle when you apply very slight pressure. I plan on fixing/hacking the screwdriver by first putting in a bit, then pushing sugru into the top of the handle. Another side note is the plastic twist comes off if you pull on it. Not really a bad think just thought I would point out how I am going to put sugru down the handle. I was having the same problem! I grid putting the metal extension all the way down the handle, however it wouldn't fit in the case when I did. I found a set of wood chopsticks from one of those teriyaki places. It fits perfectly, just cut off the end that pokes out too far. Yeah, it's not perfect. I remember reviewing it when we got a sample and I just had to remind myself, "for $10, it's a great deal and still works quite well." So yeah, it's a great little kit if you don't need anything TOO fancy. How i solved the bit falling in problem was to use the solid extension shaft recessed fully into the driver. This method gives quick change-out of bits while having a extended shaft only a step away. The chopstick trick still works well. Be sure to put the tapered end toward the chuck. Are these standard 1/4"? IE can I use these bits with other handles and other handles with these bits? Also lol@ ASCII version of image! Can I ask, what is the diameter of the head of the extention shaft? I have an enclosure that uses torx bolts that are deeply recessed in holes, and the holes are only .38". I wouldn't want to buy this wrench only to find out it won't fit down into the recess holes. The straight extension shaft head is a smidgeon more than 0.25". The bendy extension shaft is a bit wider at .44". Depending on how deeply the bolts are recessed, you could also stick the torx bit inside the 4.0 M hex socket, which is pretty long and skinnier than the extension shaft. Might be hard to recover afterwards unless you can tip the enclosure over. Though I have to say, if you're really worried about the tool being too wide, you just can't go wrong with a set of plain old torx screwdrivers. Is that star for pentalobe? You think this has the bits required to completely take apart a harddrive and put it back together? I can confirm this, first thing I did was take apart my old HDD. I have yet to see a modern drive that doesn't use small Torx everywhere, so yes. triangle bits, is the shaft by chance narrow enough to fit the access holes on a wii nunchuck? I tried the triangle bits on a DS and the bits where to large. I do not own a nunchuck to test, but if you own a DS to do a size comparison... The bit seems JUUUUUST to big. So this probably wont work on my GBA SP will it? >:[ GRRR I need to replace a part. 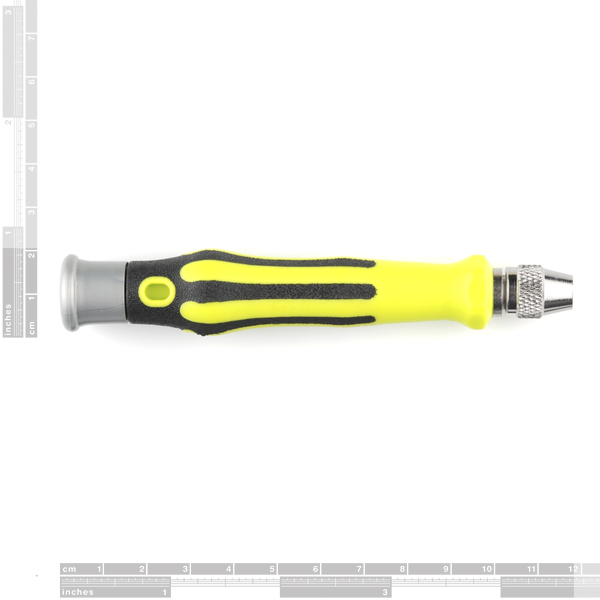 The screwdriver has a locking mechanism that is supposed to tighten down when you screw it tight. However, even when tightening in down as much as I can, the bit will end up getting pushed into the handle. Luckily, you can get it out by removing the back. But, it makes it hard to apply pressure when using it. Nice kit with more diver bits than I will ever need and some I have never seen before. The green driver handle has a chuck that it a bit of an issue. I have to wrench it down very tight to keep the bit from working its way into the handle itself. Meh. 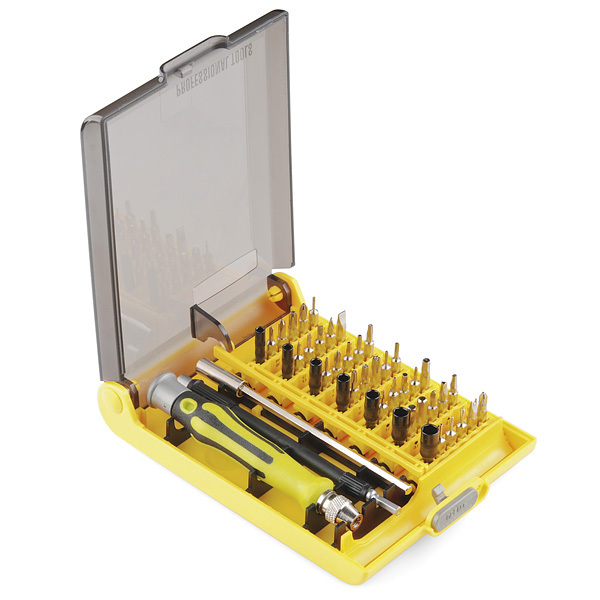 This screwdriver set works very well, regardless of the size and type of the screw. The only time I had to use a different screwdriver was when I was dealing with very large and hard to remove screws. The metal extension arm is a great addition and, if fully inserted, can be used to apply more pressure without the bit being lost inside the handle.